On 20 March 2017 Khasan Zakayev was convicted of assisting in the attack on the Dubrovka theatre, during a performance of the musical Nord-Ost on 22 October 2002, and sentenced to 19 years in prison. In the 2002 act of terror, the attackers had taken the audience hostage, demanding that Russia withdraw its troops from Chechnya. 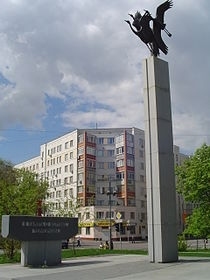 All the hostage takers, together with 130 of the more than 900 hostages, died when Russian special forces launched an operation using a toxic gas to release the hostages on 26 October 2002. According to independent sources, the number of hostages who died is 174. Most of the victims reportedly died as a result of inadequate health care provided after they had breathed the gas. As RFE/RL reports, Zakayev had been detained in March 2015 and subsequently pleaded "partially" guilty to having transported guns to Moscow shortly before the assault. However, he stated that he had no idea what the guns were intended for. As The Moscow Times reported, family members of the victims and survivors of the atrocity blame government officials for poor management of the hostage negotiations and have called for the officials who ordered the assault on the Dubrovka theatre to be prosecuted. In 2011, the European Court of Human Rights ruled the authorities had failed to provide adequate medical care to the hostages after the gas had been released into the theatre. The Moscow Times quotes Karinna Moskalenko, a lawyer for the victims and their families, as saying: "Khasan Zakaev is not the only person we wanted to see in the dock. We are talking about the responsibility of government officials. We are interested in everyone who is responsible for the so-called rescue operation."